Maharashtra is one the foremost state in the country in terms of ease of doing business since its position has significantly improved from 75 to 23. 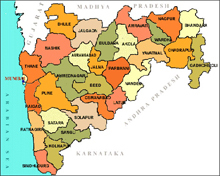 Maharashtra is India's third largest state in terms of area and second largest in terms of population after Uttar Pradesh. It is bordered by the states of Gujarat, Madhya Pradesh, Chhattisgarh, Andhra Pradesh, Karnataka, Goa and the Union territory of Dadra and Nagar Haveli. The Arabian Sea makes up the state's western coast. Mumbai (Bombay), India's largest city, is the capital of Maharashtra. Maharashtra was known as "Rashtra" in the Rig Veda, "Rashtrik" in Ashoka's inscriptions, and "Maha rashtra" afterwards, as attested by Huein-Tsang and other travellers. The name appears to have been derived from "Maharashtri" in an old form of Prakrit, an ancient Indian language. However, there are other theories put forward by different schools of thought. one version suggests the derivation of the name from "land of the Mahars and the Rattas". Another possible derivation is believed to be the corruption of the term "Maha Kantara", which means "Great Forest". Both these theories did not carry much weight, as can be seen from the name of Maharashtra. Maharashtra last year received 14 per cent of country's overall investment and this year it has gone to 24 percent. Investment in the state has grown from Rs 6,024 crore to Rs 18, 854 crore. Manufacturing and service sector has largely contributed to this. The state accounts for 18 percent of India's total service sector. Maharashtra non tax revenue has reached Rs 15,000 crore, which is the highest in the country. The improved revenue Collection and lesser expenditure has led to several welfare measures. The state has spent Rs 7,700 crore on water resources. The surfaced road length is up by 31 per cent to 4, 40, 294 kilometers in 2013/14. About 89 percent households in the state are connected by pucca roads.